A data warehouse is, by its very nature, a distributed physical data store. Distribution of your information assets assists in the performance and usability across systems and across the enterprise. Make this level of usability the cornerstone of your data warehousing mission and objective. 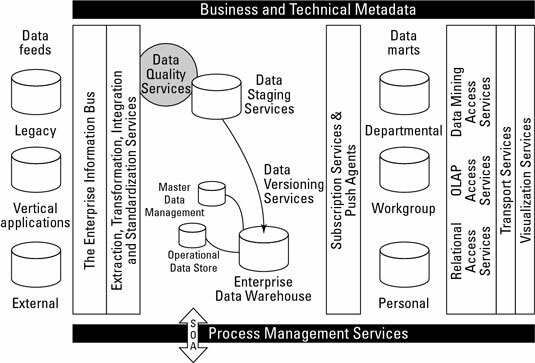 This figure shows how the important data stores of a data warehousing architecture incorporate sources of data, the data warehouse, an operational data store, data marts, and master data. A data warehouse incorporates distinct and layered data stores to enable all systems to properly access key data assets. Source data feeds are the inputs that feed the data warehouse — typically, your run-the-business application databases, as well as external data sources, such as credit rating data or market segment information. Although the data warehousing team doesn’t manage the data and architecture associated with these data stores, the team needs to understand the data feeds. Just like a horse without hooves can’t function properly, a data warehouse without sources can’t get the job done. The most difficult task you face in data warehousing is choosing the right source, or system of record, for data that moves into the data warehouse. If the data is of low quality or isn’t readily available, you have a hard time supporting a high-quality data warehouse.